After watching the team’s record fall to .500 for the first time since early November, the Lakers went into the TD Garden Thursday night jaded from weeks of trade rumors, hobbled with a litany of injuries and, most importantly, playing without their new additions. On the opposite side of the court was a team that had won 13 of their last 14 at home, and licking their chops at the chance of widening the head-to-head gap between the NBA’s two most storied franchises. Conventional wisdom said the Lakers would need a vintage LeBron James performance and the King delivered it, but it was his supporting cast – particularly the team’s much maligned shooters that made the 129-128 upset in Boston happen. Coming into the game ranked 29th in 3-point percentage (33.4%) and converting a shade over 10 triples a night, the purple and gold exploded for a franchise-record 22 makes from beyond the arc on 53.7% shooting. James, Kyle Kuzma, and Kentavious Caldwell-Pope buried five each. Rajon Rondo and Lance Stephenson added three apiece, and Brandon Ingram also contributed a key one from the left corner in the fourth quarter. That level of accuracy allowed the team to finish the game with 35 assists – the second biggest tally of the season. A quick breakdown tells us that 19 of those 22 shots were assisted, with the exceptions being a pair of James step-back jumpers and one from Rondo. They also found their shots in a wide variety of ways, or more precisely, James and Rondo found them for their teammates. James driving and dishing to generate spot-up threes was a theme in the second half – and one that could benefit players like Reggie Bullock and Mike Muscala once they make their debuts on Sunday against the 76ers. LeBron led the team with 12 assists. This cross-court pass to a wide-open Ingram was just a small sample of his court vision. Rondo also finished with double digit assists (10) and was locked in from the beginning, connecting on a pair beyond the arc in the first half. He also realized early on the Lance Stephenson had the hot hand, and Born Ready didn’t disappoint him. Pay close attention on this sequence to Tyson Chandler’s screen to free up the former Pacer. The nine 3-pointers in the third quarter allowed the Lakers to completely erase an 18-point deficit and take the lead. Back-to-back bombs from Caldwell-Pope and James tied the game with 1:24 to go. And Kuzma’s strike from the right wing gave the Lakers the lead with 19 seconds left in the game. 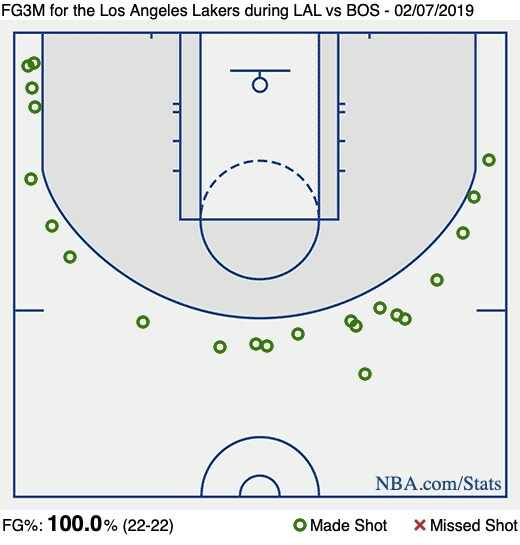 Of course, fate would have it that a Rondo deuce would be the shot of the game, but the Lakers don’t steal that road W without this deadly outside shooting performance. And with Bullock and Muscala on the way, this might have been just a preview of what’s to come.